This is an In Person Signed Colour 10" x 8" Photo of the popular British Golfer. 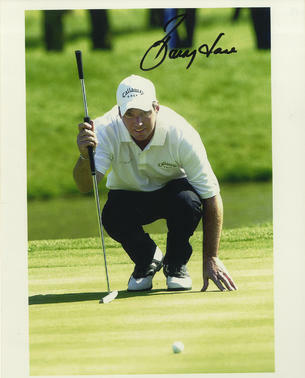 Barry Lane (born 21 June 1960) is an English professional golfer. Lane was born in Hayes, Middlesex. He turned professional in 1976 and first played on the European Tour in 1982. For the first few seasons he failed to finish high enough on the Order of Merit to retain his card and he made several visits to the Qualifying School, but by 1986 he was established on the tour. His best years came in the early to mid nineties, when he made the top ten of the order of merit three times, with a best of fifth in 1992. He won four European Tour events between 1988 and 1994. He had a relatively bad period in his later thirties, but after the turn of the Millennium his form improved again and he picked up his fifth win on the Tour at the 2004 Daily Telegraph Damovo British Masters. Lane has won several professional tournaments off of the European Tour, most lucratively the 1995 Andersen Consulting World Championship of Golf. This event was a precursor of the WGC-Accenture Match Play Championship and Lane's prize was US$1,000,000, which was a very rare level of prize in golf at that time. Lane made his only Ryder Cup appearance in Europe's home defeat at The Belfry in 1993, losing all three of his matches. He has represented England in the World Cup and the Alfred Dunhill Cup several times, and has played for the Rest of the World Team in the UBS Cup three times.